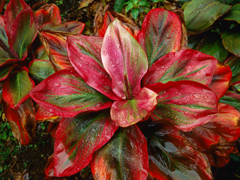 Jigsaw puzzle N12: Red plant. Free online jigsaw puzzles. Two cowboys come upon an Indian lying on his stomach with his ear to the ground. One of the cowboys stops and says to the other, "You see that Indian?" "Yeah," says the other cowboy. "Look," says the first one, "he’s listening to the ground. He can hear things for miles in any direction." Just then the Indian looks up. "Covered wagon," he says, "about two miles away. Have two horses, one brown, one white. Man, woman, child, household effects in wagon." A cat sees about six times better than a human at night.